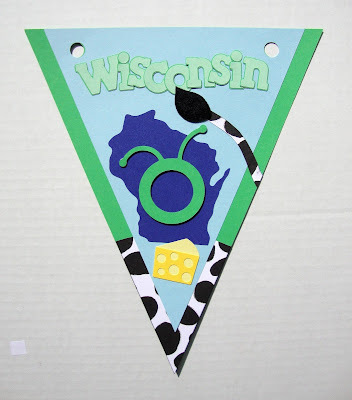 There was a contest for the Road Trip to CHA that you could make a banner representing your state or country. You can see the banner I made on THIS POST. I promised I would take pictures of everyone's banners as they were hung around the room. It turns out that due to the hotel's requirements, the banners couldn't be strung about so they all ended up on one wall together. I thought there would be more but they do all look so great! Close ups from left to right. I hope you see yours if you sent one in! Remember, you can click on the pictures to see them larger if you would like to see more detail. The #1 winner was the pennant below that says Skyline Drive. It has 3D elements that you really can't appreciate in the picture. Beautiful! Michael from PC stopped by to say hello! He talked to the whole group about what to expect tomorrow and then spent time visiting each table. Gotta love a WI boy! :) I took a picture of the back of him because look at his awesome shirt! That's AmyS there in the red shirt, Makeupgirl217 in the middle, and Scrapalette taking a drink. A HUGE thank you to Scrapalette for organizing the dinner! I ate with Pinkbug (Kim, right) and Debbie (left). They are so nice! Just from the three of us, we represent the US friom South Floirda to Wisconsin! I love the variety of people you get to meet at these events. That's it! I know, not many pictures. I promise to take more at the event and share! Be back later! 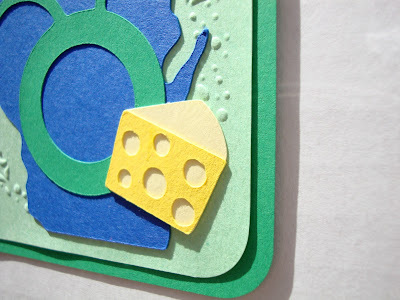 The card is 3x3 and I used a CM corner rounder to soften the corners. 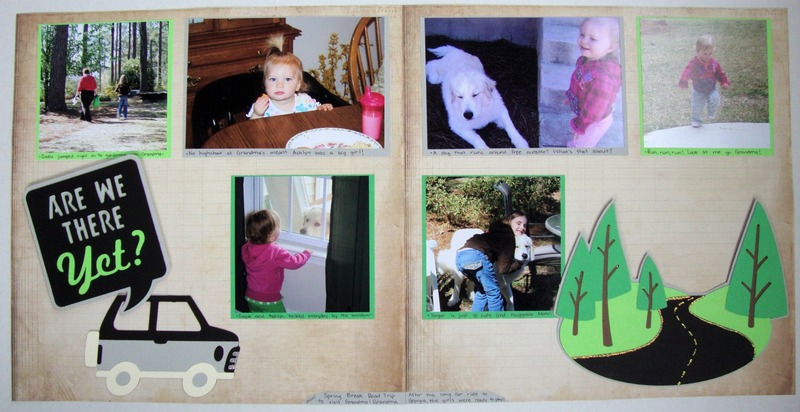 The light green layer is embossed using a Disney Princess Cuttlebug die. It was then sprayed with Honey Dew Tattered Angels Glimmer Mist to give it a little bit of sparkle (hard to see in the pics). WI is cut from 50 States, at 6". The circle logo is cut from Cricut Everyday at 2". The cheese is cut from Create a Critter at 0.75". 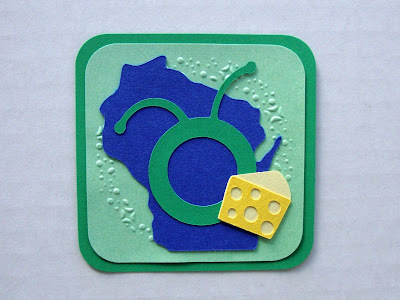 I love cheese and WI is famous for it! The banner is from Birthday Bash at fit to page on a 12x12 sheet. WI, the circle log and cheese are the same as above. I hand cut the cow's behind and tail :) I then flocked the end of the tail with Black flocking powder. 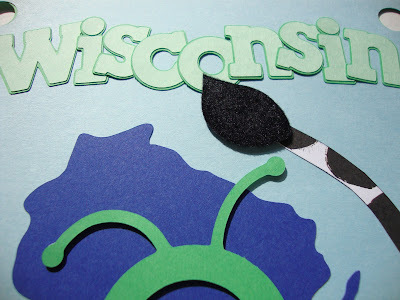 Wisconsin is from Birthday Bash, both regular and shadow, cut at 1.25". First I picked the picture I wanted to use. This is my husband with his mother, grandmother, and our daughter last year on Mother's Day. We really had a wonderful dinner out all together to celebrate these wonderful women. This is a 4x6 picture but I wanted it to take up more room so I matted it at 5x7 and 5.25x7.25. The punch along the bottom of the green paper is a Fiskars punch but I don't know the name of it! I wanted to do some sort of flourish so I went to my favorite cart for that, Storybook. I cut the flower vine from the letter K key, in the border and main cut at 3" in multiple colors. The smaller yellow main cuts are 2". 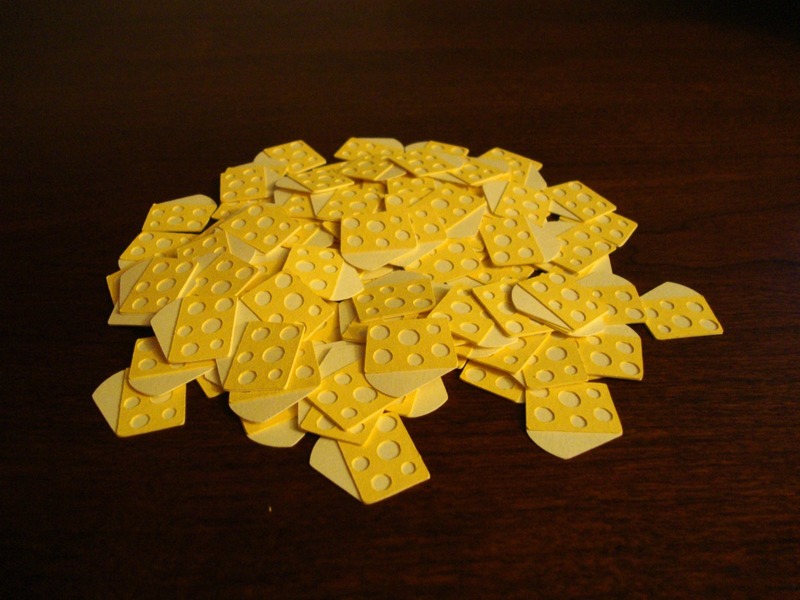 I cut the corner cut from the same K key at 2" in brown and 1.5" in yellow. I used the Baby Steps cart to cut my title, both in regular and shadow at 0.75". When I was finished, I used my i-Rock to add a few gemstones hidden in the flowers. I just wanted a minor touch of sparkle. And that's it! A big thank you to Robyn at MPS for hosting a design team and allowing anyone who wants to, to enter! It would be a huge honor to be chosen to design for her! Thanks for looking! I have two winners to announce today! Exciting! Thank you everyone for visiting and supporting me! I will contact the winners so be looking for that. Tomorrow I will post what all that cheese was for! I am so excited to go to the Ohio Circle meet up this weekend!! Woohoo!! 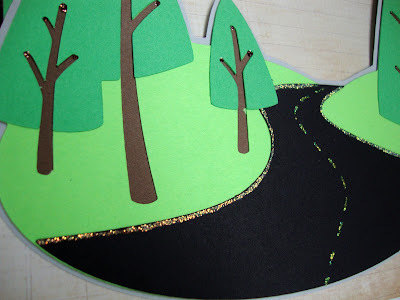 Welcome to the It’s a Wrap Blog Hop hosted by Cool Beans By L.B. Do you like to receive gifts? How about give them? Well this hop is all about the outside…the wrapping - gift bags, boxes, baskets and more! There are 22 wonderful stops on this hop and we hope you will take some time to stop in and see everything we have created for you. Hopefully you arrived here from Anabel. If you just happened to stop by, you can go to the beginning at Cool Beans By L.B. To make these bags, you take a standard 8.5x11 piece of cardstock and cut it in half vertically. Then you take your 4.25x11" piece of paper and score it at 1.25", 5.5" and 6.75". Fold on those lines. 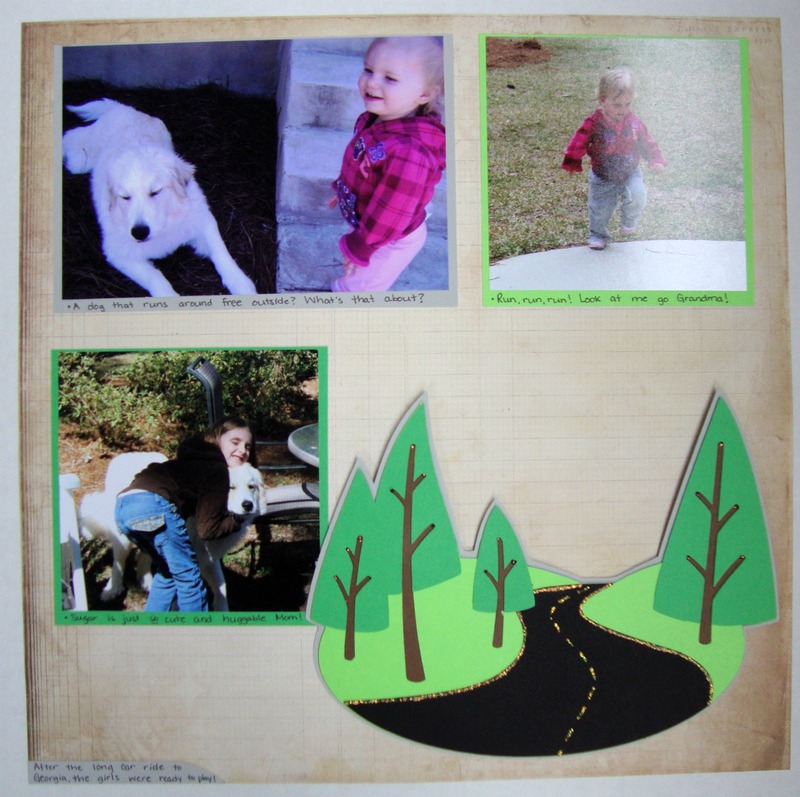 I used the Centerpoint button on my Cricut Expression to cut an image in the center of what will be the front panel. That space is 3" tall once you account for the inch the flap takes up. I found that generally cutting my image at 2.5" works the best. On this bag, I used Doodlecharms and cut the tree border at 2". I then used my I-rock to add a gem to the top of each tree. I put ribbon around the flap to decorate the top. It is easiest to decorate the entire thing how you want it before adding your candy to the inside. Just make sure that your staples will be covered by the flap. I made one last bag, this one being more of a summer theme. The ice cream cone is from Sweet Treats, cut at 3". This one also has the top flap glued into the inside of the bag, so that gives you more options as well. I used glitter in multiple steps to create the ice cream cone with a purple scoop. 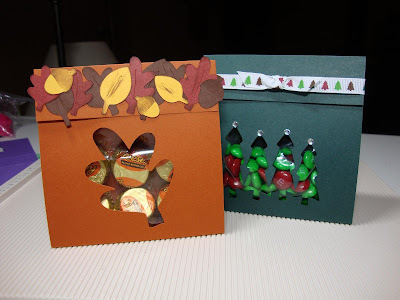 I hope you have enjoyed this look at another way to make treat bags! I love to give gifts and sometimes a little candy is all you need to cheer someone up! I am offering some fun blog candy on this hop. Since the theme is giving and wrapping, how about an envelope package? I'd love to send you these three envelope packages from The Paper Cut! To win, please leave me a comment telling me one gift you have given someone that has made YOU happy. Be sure to leave me a way to contact you!!! You do not have to be a follower to win. If you are interested in following me, please also see the post below this one, as I am celebrating reaching 200 followers and I have a separate giveaway for that! 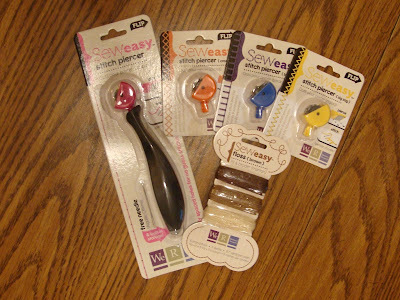 I will randomly choose one winner for each drawing on Sunday, July 17! Thanks for stopping by on this fun hop! Your next stop is my personal friend, Alicat! If you get lost here is the whole list for this hop! Alicat from http://scrappingwithalicat.blogspot.com/ <--- Go HERE next! 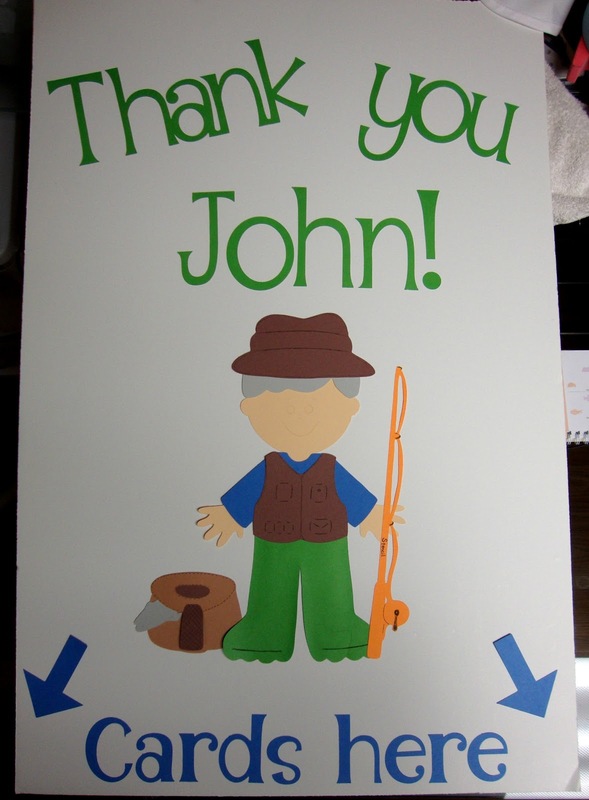 There recently was a group that put on a benefit for a wonderful man named John. John is an older gentleman who has been having some health issues. He lives in a small, Northwoods community and he is the man you would call if you need help, an odd job done, a buddy to do something with. Rather than calling it a benefit and having it's purpose be to raise money, the purpose of the get together was to thank John for all he has done for you and to celebrate him. The font is Alphalicious. I used the phrase feature for thank you and the regular letters for the rest. 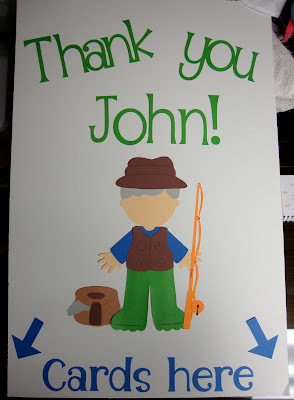 I didn't attend the event but I heard John was very well thanked by many of his community members! I think that was such a great idea, the thank you party! Thank you Missie!!! We are loving them! Don't forget to enter my 200 follower giveaway! 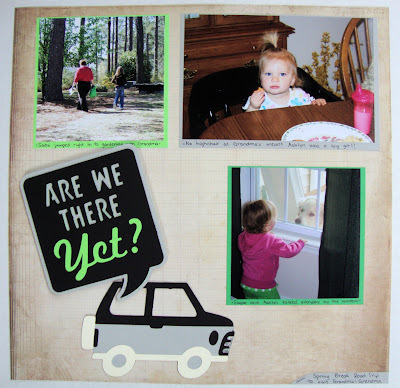 And this Saturday I will be in a blog hop so stop back! Thanks for stopping by! Today I am sharing the second layout I was able to complete at a crop night I recently attended. This layout uses the Cricut cartridge Campin' Critters. I am so excited about this cart! I love it! The car originally had a bunch of bags piled up on top but that's not how we traveled so I cut them off. The car was cut at 4.5". The saying was cut at 5.5". It is up on pop dots so it's coming out of the back windows where the kids travel. In all seriousness, the kids were great travelers but we were all ready to get there after being in the car for most of two days! Stickles - yay! The road has white stickles along the outside and white dashes along the middle (even though it looks the opposite in the photo). Then if you look closely at the trees, I put a brown dot at the end of every branch. I thought that just made it a little bit cuter. This layout completes my scrapping of our Spring Break trip to Georgia. Finally! Only a year and a half after it occurred! LOL!